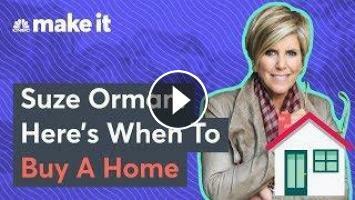 ﻿ Suze Orman: Can You Afford To Buy A Home? Can you actually afford your dream home? Here's how to figure it out. It takes more than just a down payment to buy a home. Sometimes you need a lot more. How can you tell if you're actually able to swing it? "I want you to play house," Suze Orman, financial expert and best-selling author of "Women and Money," tells CNBC Make It. Here's what she means: Once you've socked away enough for a 20% down payment and saved up an eight-month emergency fund, spend six months trying to get by on what your new budget would be as a homeowner. That's usually your monthly mortgage payment plus about 40%. "When you buy a home, you have property taxes, you have insurance and you have maintenance," Orman explains, and you'll also need to factor in closing costs and other fees. "All those things will cost you 40% more than your mortgage payment." Say you currently pay $1,000 per month in rent and expect a monthly mortgage payment of about $1,000, too. To see if that's what you can afford, Orman suggests putting an extra $400 into savings each month to represent the additional amount you'd have to pay as a homeowner. If "all of the sudden, you're struggling," then "you know that you are about to buy a home that's too expensive," she says. If you're managing just fine after six months, though, you can realize you're in a good place to afford that home. Plus, "you have $2,400 to put towards your closing costs," Orman says. So "that's what I would do if I were you." It's also important to remember that no matter how much money you have put away, there's no correct time to become a homeowner. "The right time for you to buy a home is when you want to buy a home," Orman says. Similarly, you should think of a home as a place to live and call your own — not as an investment. That's because "it might go up in value, but it might go down in value." There are no guarantees. "If you look at it as an investment and you sell it, where are you going to live?" Orman adds. "And just because it goes up in value doesn't mean that you're going to sell it." Other experts agree: Returns on the residential housing market are "not making anybody rich," Eric Roberge, a CFP and founder of Beyond Your Hammock, previously told Make It. "You're barely keeping up with inflation, not to mention all of the costs that go along with owning a home." Indeed, a study from London Business School and Credit Suisse found that, after adjusting for inflation, housing offered returns around 1.3 percent per year from 1900 to 2011. By contrast, the average annualized total return for the S&P 500 index over the past 90 years is around 9.8 percent. "Owning a home may help you save money, but it won't help you make money," concludes CNBC's Diana Olick, citing another new study conducted by Florida Atlantic University, Florida International University and the University of Wyoming. As Orman says, "I would look at a primary residency as a place that you love, and that hopefully you'll make money on, but if not, it's okay, because it's your home." Suze Orman: Here’s exactly how much money you need to afford to buy a home | CNBC Make It. Easy Marinara Sauce Recipe - How to Make Perfect Marinara Sauce at Home!